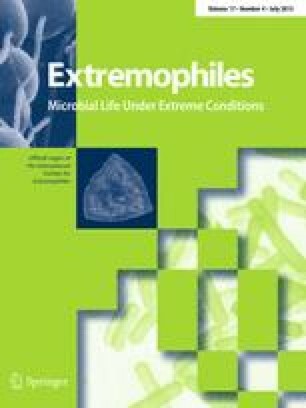 The potential for surfactant production by the extreme halophilic archaeon Haloferax sp. MSNC14 in the presence of individual hydrocarbon substrates was studied. This strain was selected for its ability to grow on different types of hydrocarbons at high NaCl concentrations. Linear (n-heptadecane or C17) and isoprenoid (pristane) alkanes, a polyaromatic hydrocarbon (phenanthrene) and ammonium acetate (highly water-soluble control compound) were used as growth substrates. The adherence potential was demonstrated by the ability of the cells to adhere to liquid or solid hydrocarbons. The biosurfactant production was indicated by the reduction of the surface tension (ST) and by the emulsification activity (EA) of cell-free supernatants. Growth on acetate was accompanied by a low EA (lower than 0.1) and a high ST (~70 mN/m), whereas an important EA (up to 0.68 ± 0.08) and a reduction of ST (down to 32 ± 2.3 mN/m) were observed during growth on the different hydrocarbons. Both ST and EA varied with the growth phase. The adhesion to hydrocarbons was higher when cells were grown on C17 (by 60–70 %) and pristane (by 30–50 %) than on phenanthrene (~25 %). The results demonstrated that strain MNSC14 was able to increase the bioavailability of insoluble hydrocarbons, thus facilitating their uptake and their biodegradation even at high salt concentration. This work was funded by Grants from the French National Program EC2CO “BIOHYDEX (BIOdégradation des HYDrocarbures dans les milieux EXtrêmes’’). We thank the anonymous reviewers for helpful comments and suggestions.